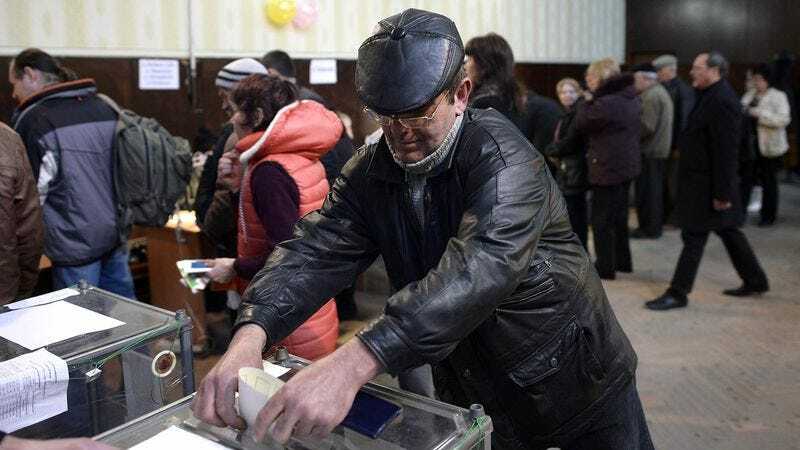 SIMFEROPOL, UKRAINE—Following yesterday’s referendum in which 97 percent of voters cast ballots in favor of seceding from Ukraine and joining the Russian Federation, Crimean citizens expressed their excitement Monday at participating in the democratic process one final time. “It brought me such great personal joy to head to the polls and, for the last time ever, have my vote tallied and actually mean something,” said local businessman Sergei Petrov of his vote in support of annexation by Russia, echoing the enthusiasm of hundreds of thousands of his fellow Crimeans who proudly took part in their final opportunity to assert their collective will at the ballot box. “Yesterday was a historic day for Crimea. Our people had a say in their future, and our voices were heard loud and clear, which is extremely special given that it won’t happen again for who knows how long.” At press time, Crimeans were commemorating the vote to become Russian citizens by eagerly watching and reading coverage of the momentous event in the limited handful of sanctioned media sources they now have available to them.